University of Idaho freshman quarterback Dylan Lemle is throwing in a preseason drill. He is tight, electric, bouncing, as if each new instant of awareness of his receivers’ unfolding routes sends a jolt through him. By contrast, senior Matt Linehan approaches the drill with loose, rolling shoulders. He takes the snap, and it seems the entire repetition is a continuos, languid thought. Unhurried but efficiently, Linehan delivers the ball with velocity, on target, with a high, short stroke that economizes motion. It was a moment in a drill. Linehan probably never gave it a second thought. But if he did, he might have seen his former self in Lemle. “As a freshman, I was all about trying to make everything happen. I’d force every play,” he says. How time passes. In a long, sometimes difficult journey, Linehan, as a redshirt freshman, led Idaho forward from a 1-10 season of despair in 2014 to a hopeful 4-8 in 2015 to the breakout 9-4 last year. 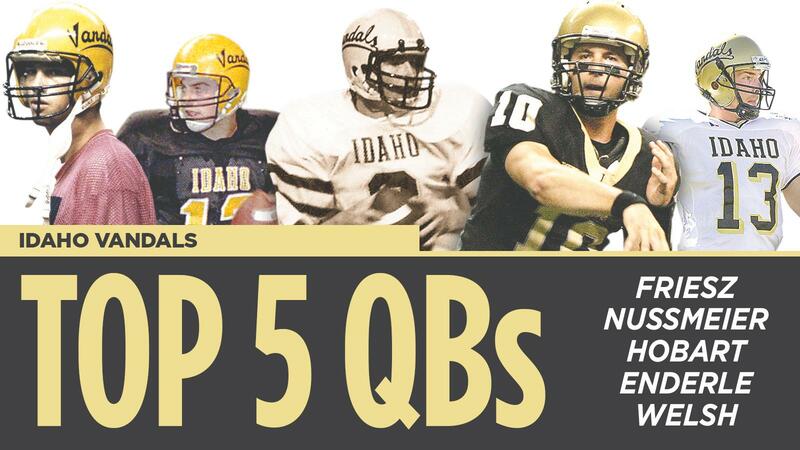 With a season to go, this is what one of the Vandals’ all-time passing leaders looks like. Linehan is already in the top five for pass attempts, completions and yards and with 2,129 more yards he will surpass Doug Nussmeier’s record 10,824 career passing yards. Linehan has joined John Welsh, MVP of the 1998 Humanitarian Bowl, and Nathan Enderle, who led Idaho to a comeback win over Bowling Green in the 2009 Humanitarian Bowl, as Vandals who have quarterbacked a bowl win. Linehan threw for 381 yards and four touchdowns in a 61-50 shootout over Colorado State in the Famous Idaho Potato Bowl last December. Coach Paul Petrino can’t contain a smile as he looks forward to the next four months and a final go-round with the exceptional quarterback to whom he gave his lone NCAA Division I ride. Petrino said Linehan made his most ambitious strides as a quarterback between his first and second seasons and between last year and now. Linehan has progressed in measurables like passing statistics and wins and in a quarterback’s prized intangible, leadership. If the emergence of this can be pinned to a single event, according to Linehan, it would be Idaho’s game against Troy University in 2015. Throughout Idaho’s preseason camp, quarterbacks coach Charley Molnar has shadowed the taller Linehan like a pilot fish hovering about a shark. Molnar sees the same things in Linehan that Petrino does. But even now Linehan is a master. On a certain level, football is all in service of a player years later being able to look back fondly at being part of a team. “I love the guys here, being in the locker room. This place is special to me,” Linehan said. One of those guys, Jacon Sannon, has caught as many passes from Linehan in practice and in games as anybody. They came in together as skinny freshman and over the years as quarterback and receiver they developed a tight bond. “His ball has got a little heat on it,” said Sannon. “Most of the time it’s right where I need it, and if it’s not it’s in a safe spot where the defense won’t blow me up.” A receiver’s highest endorsement. 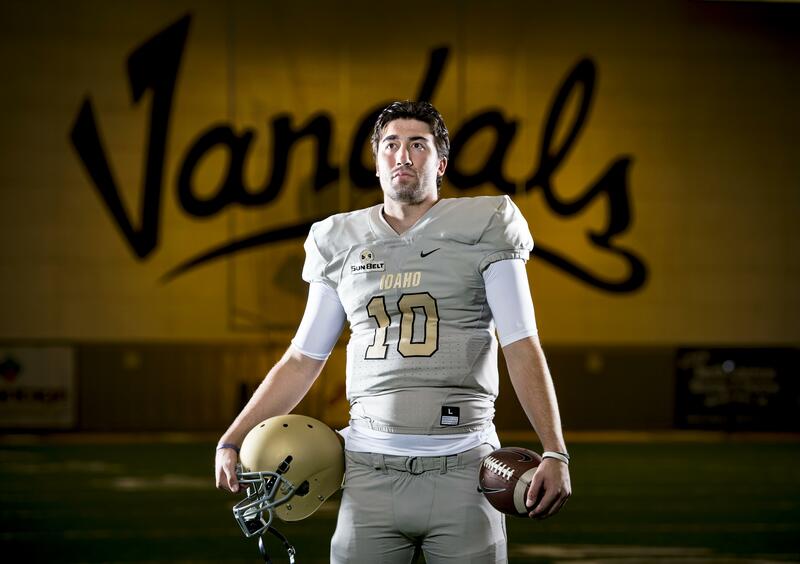 Linehan and his brother, sophomore linebacker Michael Linehan, are the latest to take up the family business, Vandals football. Their father, Scott, starred at quarterback in the mid 1980s and is one of the figures Matt is chasing through the UI record book. Their uncles, Ron and Rick, anchored Vandal defenses as a linebacker and defensive back, respectively, in the 1970s. But Matt’s own connection to UI and Moscow was tenuous. After serving as Idaho’s offensive coordinator in 1993, Scott Linehan’s coaching career took him to a couple of universities and five stops in the NFL, most recently Dallas. But Scott and Petrino had coached together at Idaho, and when Matt, as a high school senior, was drawing so little interest from Division I teams that he was planning to pursue his first love, basketball, in college, Scott sent Petrino a highlight tape of his son. Matt readily accepted the only Division I scholarship he was offered. Since then, he has been able to meet all the people ahead of him in the Vandals record book, John Friesz, Nussmeier, Enderle, Ken Hobart. And after this season he would like to continue playing in the NFL. Molnar thinks it is possible.